KIEV, Ukraine -- Kiev residents were quietly going about their business and many seemed not much interested in the biggest sports event seen in their country in decades: the Euro 2012 final between Spain and Italy on Sunday. "A few more customers than normal, a few more foreigners, but in this kind of beautiful weather any Kievite punts the city if he possibly can," said Nataliya Drach, a saleswoman at Harchuvan'ya, a family-owned grocery store on a Kiev main streets. "I won't watch the game, but my husband might," she said. "Once our team (Ukraine) and the Russians left the competition, we really don't have any one to cheer for." Kiev's three kilometres long fan zone, where an estimated half a million plus fans in yellow and blue had gathered to cheer their side on in a June 19 defeat to England, was almost deserted on Saturday afternoon. Young men dressed in costumes of Disney movie characters sat on park benches under a bright sun, waiting for someone to walk by and ask for a photo snap with them. "I wouldn't call this a party atmosphere," said student Volodymyr Myhailik, sweating in a furry panda costume. "Just an average weekend." Pubs and sidewalks a mere two blocks from Kiev's glittering Olympic Stadium, refurbished for Euro 2012 at an estimated half billion dollar cost to Ukrainian taxpayers, were thinly-attended or even empty on Friday evening. At the popular Time Out bar only the bartender was actually watching a game, while a waitress, lacking customers, was chatting on a mobile phone and smoking a cigarette. Ukrainian government spokesmen were, on Saturday, proudly reporting the planned arrival of dozens of international dignitaries to the championship game - a feather in the cap of the former Soviet republic, which prior to Euro was widely criticized as too corrupt and inefficient to host a major football championship successfully. At Euro 2012's outset, top European officials led by EU president José Manuel Barroso and German Chancellor Angela Merkel announced they would be uncomfortable attending games in Ukraine because of worries about weak rule of law in the country. However, Spanish Prime Minister Mariano Rahoy Bray, Italian Prime Minister Mario Monti, Polish President Bronislaw Komorowski and Polish ex-presidents Lech Walesa and Aleksander Kwasniewski, are set to attend the final on Sunday - top politicians from the nations of the finalists and the tournament co-hosts. Rubbing shoulders with the EU officials in the VIP seating will be Belarus' authoritarian President Aleksandr Lukashenko; the Presidents of Moldova, Tajikistan, Armenia and Georgia; and the Prime Ministers of Hungary and Moldova, Ukrainian news reports said. More than 7,300 police would be on hand to provide security for the Spain-Italy game, officials at Ukraine's Interior Ministry said. Crime had been extremely low throughout Euro, they said, and on Friday "no serious Euro-related criminal incidents, of any kind" had even been registered, a ministry statement said. 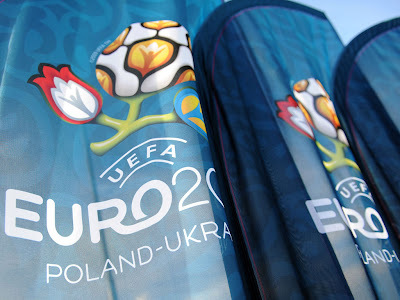 The final, like all other Euro 2012 matches, was to be aired live on Ukrainian television. As many as 150 million viewers would watch the final worldwide, Korrespondent magazine reported. More than 2,000 game tickets were still on sale at a price of some $440 dollars each, an UEFA official said on Saturday. The price was almost the exact equivalent of the monthly salary for a Kiev factory worker. Scalpers outside Olympic Stadium, on Saturday afternoon, were accosting strangers and offering handfuls of cheap seat tickets, at face value, in the $20 to $40 dollar range. Some 36 hours before the final, only a few potential buyers were walking by, a few pushing prams or riding skateboards or bicycles, or just out strolling or shopping. The scalpers were finding few takers.